New Herberger Institute of Design and Arts (HIDA) Institute Professor Michael Rohd and his HDA 494/598 Civic Body: Art and Public Health class have been running graduate workshops with invited professionals and advanced graduate students to help his students frame their own work. Each guest uses civic engagement as part of their art, activism or other practice. This report includes descriptions of the sessions themselves and the two main methods Professor Rohd used to encourage dialogue. I participated in two sessions with the class as part of the GISER (Graduates in Integrative Society & Environment Research) student group and my interests in transdisciplinary and participatory design practice. The main group was a class of graduate students being run by Professor Rohd and other participants included members of the Center for Performance and Civic Practice (CPCP) and Sojourn Theatre and members of the ASU community. 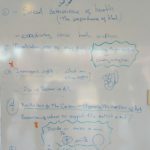 Several participants at the seminars had backgrounds not specifically related to health but all either had a creative practice, had worked in healthcare, worked in some related field or all of the above. The first session involved meeting with the students in HDA 494/598 in a set of interview-and-report discussions. Each guest discussed their work in relation to civic practice with a few students, then the students reported to each other their findings. This was followed by a general discussion. 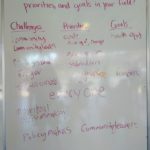 Topics included sustainability (especially of arts), systems, connectivity, finding common language and academic silos. Questions that emerged included what are the incentives to communicate; and whether breaking down barriers is enough returning value. One participant suggested figuring out how to build community in splendid ways. Another suggested that even labels such as ‘creative capital’ & ‘social justice’ are already silos. University-specific topics included critique of practices that turn universities into “management tools instead of places of investigation” and the university as a place of “ideological warfare”. One participant, who researches a vulnerable population described it as “I don’t want somebody else’s non-freedom to pay for me.” Another topic discussed was the difference between caring about an issue and actual policy and budget prioritizations that make a difference. The second session involved more participants from outside the class, including members of CPCP and Sojourn who were visiting as part of a workshop series. 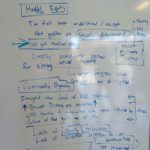 Held in the old Ceramics Research Center, it featured a huge whiteboard wall that was used for recording questions on. Some of those questions involved the civic body, health and how art can stitch fields together. 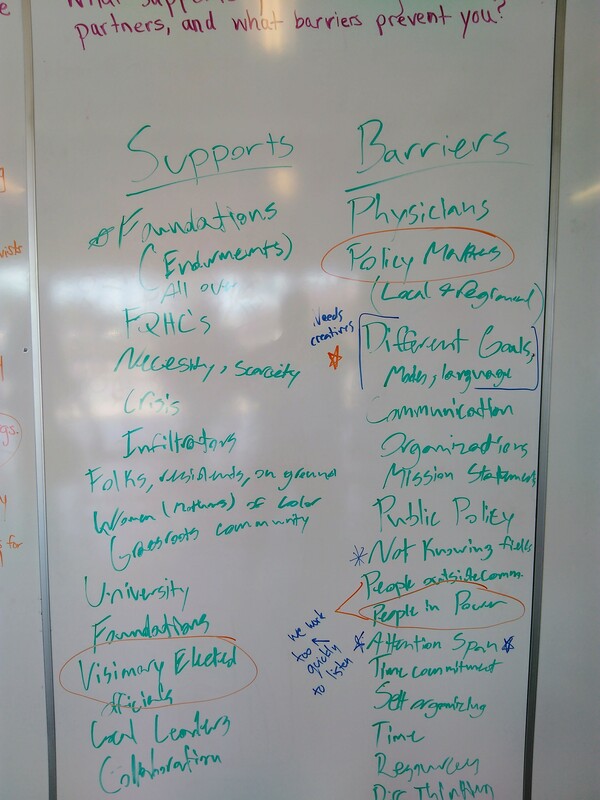 Another topic was the difference between working in “intersectional space” versus silos. 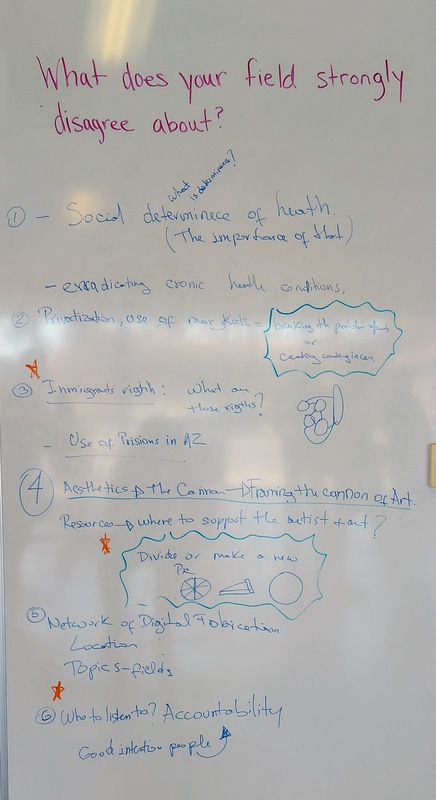 On the whiteboards, Professor Rohd had written a definition and six questions. 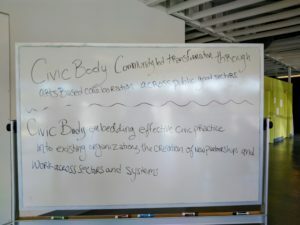 The group discussed the definitions of Civic Body posted, see image below. After some discussion the phrase, “Civic Body: embedding new practices into existing organizations.” was used as a working definition. 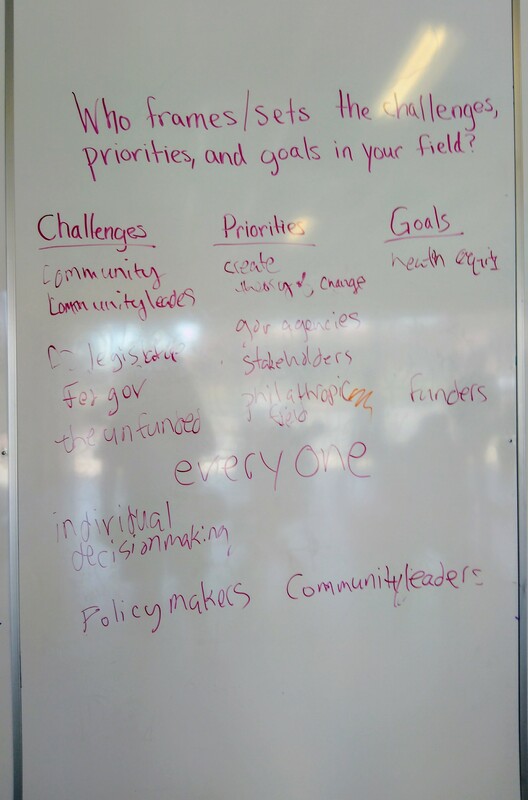 What are challenges for your field for working on current problem? Who frames the challenges, priorities and goals in your field? What does your field strongly disagree about? 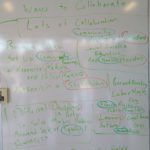 In what ways do you currently collaborate to solve problems? 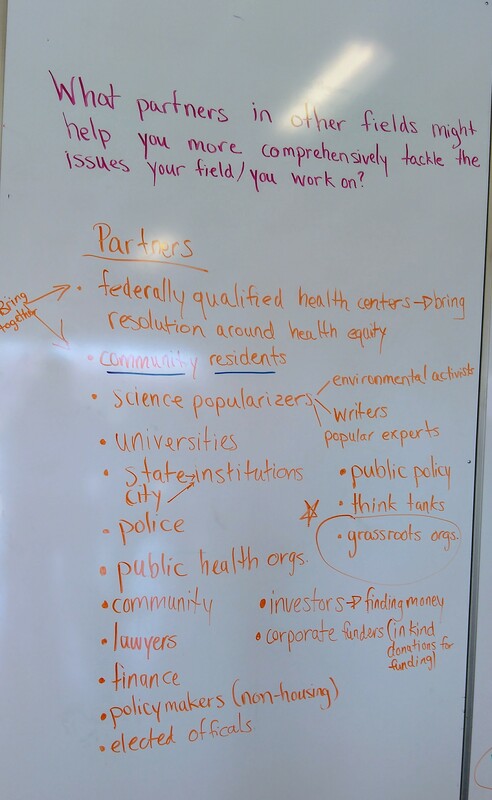 What partners are in other fields who might help tackle issues in your field? 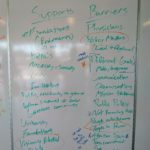 What supports you working with these partners and what barriers? 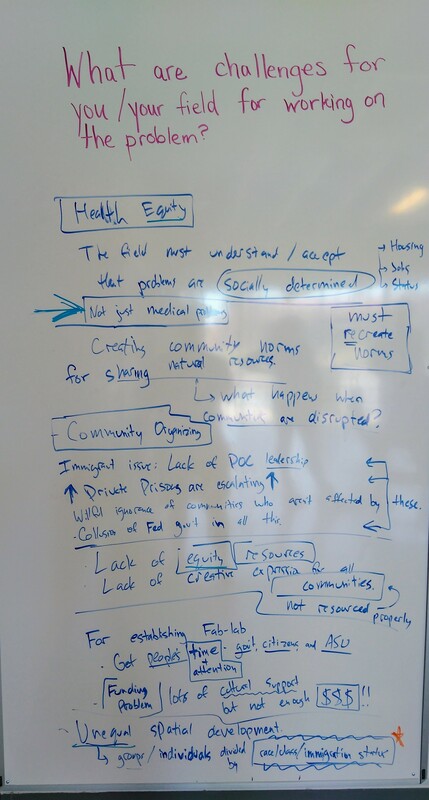 Some of the discussion around these questions and the group’s answers included creating new “grassroots think tanks” around emerging issues and wicked problems. A student said they liked the “Yes, and…” energy in the room. Yes-And is used in design research, improvisational acting and other fields as a potent dialogic spur. 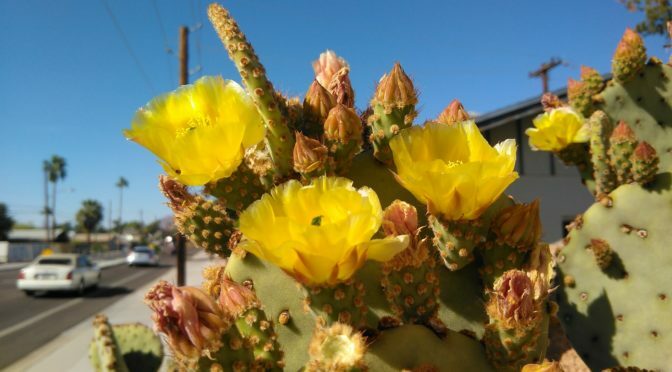 Slowing down to experience the world and the gap between attention spans and current profit models was brought up, with a suggestion to stop for a moment and figure it out. Time and attention span came up repeatedly as enablers and limiters in both sessions. One of the visiting performers described their personal work as working inside and dissolving fields. They also expressed an interest in why various work but centered around creative, non-profit performative arts has become so professionalized. A guest graduate student suggested that people work together when their success is interdependent. 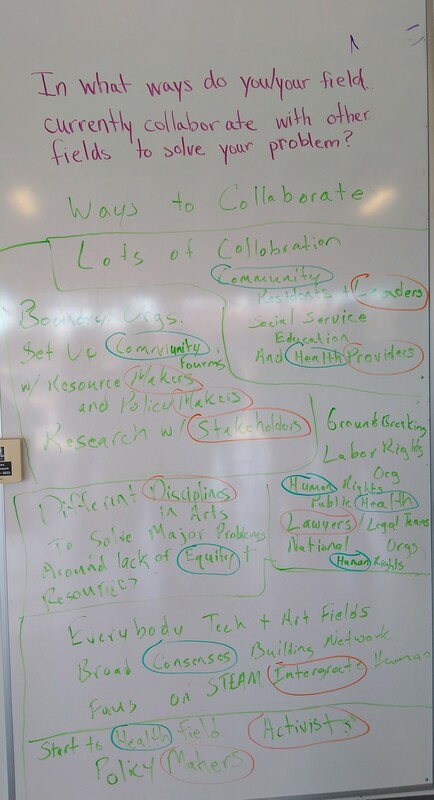 Figuring out where and why to highlight communities of interdependence was the challenge. This also related to the discussion on time and attention spans. A student said that often all the intelligence needed for community change exists inside that community. Often the only thing lacking is the resources to effect change. Collaboration is popular, but messy and it’s often uncertain how to collaborate. One student wanted to know what it means to be an infiltrator or accomplice and whether people are, or should be willing, to disrupt the status quo? The first student said that there was lot of imposed language and that sharing dialogue before actual work begins is useful. They also said that struggle achieves equity. One of the guests wanted to know if the concepts connected with the reality of change and emphasized how important spirt is. All agreed that change and collaboration are messy and hard but needed. Professor Rohd suggested a tactic for change was to turn allies into partners and that this leads to action. The critical question any organization needs to answer is how to build alliances that thrive in the struggle encountered? A guest suggested bonding time among collaborators helped and constantly doing things to maintain participant interest. Another participant mentioned the importance of time, that sometimes a project needs twenty years to achieve it’s full potential. Some things work best when created quickly, some need these long incubations. Community means different things to different people, said another day-to-day survival is what leads to change, terms like social justice and community organization are tools, language. There is a Tragic Gap that according to Rohd is the difference between “What does home mean to you?” and “How do we provide equitable housing?” This gap includes water, housing, infrastructure and institutional access inequities. Dangers include undoing other organization’s work or being involved in dreamy instead of grounded work. Grounding language and supporting infiltrators, disruptors and other allies inside institutions could be useful tools. Pictures of the filled out question boards from the second session. A wide range of opinions and needs were expressed but all center on ways of engaging people, institutes and capabilities together. 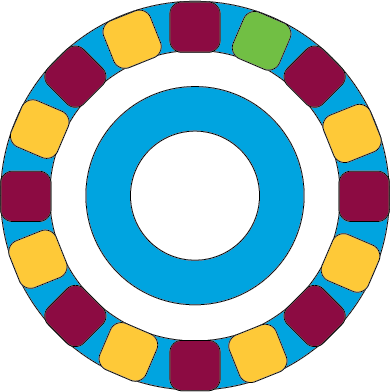 The active discussion phase of the dialogue circle. The moderator is in green, students in gold and guests in maroon. Generally, the methods used by Professor Rohd in these sessions were to encourage dialogue between participants. Any props such as notebooks, whiteboards or laptops were curated to remain as backdrop, even while prompting vigorous discussion. 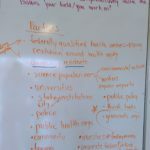 This is similar to the Dialogue Circles by Glenn Aparicio Parry of the former SEED Graduate Institute, but with whiteboards instead of talking sticks. The active listening/student discussion phase of the dialogue circle. The moderator is in green, students in gold and guests in maroon. Both sessions centered around a dialogue model that involves cycles of expansion and contraction, with participants being active listeners for a while then active discussers. 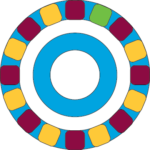 Some of it happens organically, but the cycle between listening from the outside and being part of the discussion encourages reflection in a way that just being in a circle can limit. The first session with the class consisted of a series of interview, report and discussion activities. Guests were matched up with pairs of students who had done some research and prepared questions for the visitors. The Q&A lasted about 10 minutes, followed by the students comparing notes in a circle. After that they brought the guests into the circle to talk. The session was finished with the guests having a few minutes to discuss while the students just listened. The second session featured introductions and a short discussion on definitions, especially of the term Civic Body. This was followed with each guest having 30 seconds to answer each of the six questions on the wall. This fast format worked well with the questions posed because it kept everyone on point. The questions were generic across practices and framed to spur short answers, which helped make it engaging. This data-gathering phase only lasted a few minutes. These question boards provided a record to discuss over for the rest of the session. After the questions the guests gathered together and talked about the results. Then the students gathered in an inner circle and talked about the results, then brought the guests into the circle to continue through a final Q&A session. This cycle of discourse contraction and expansion can be repeated for longer workshops. 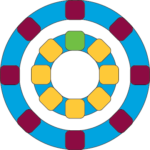 It provides alternating analytic and observational phases for all participants. These formats could be combined with Six Thinking Hats technique, roleplaying or possibly some forms of active listening. 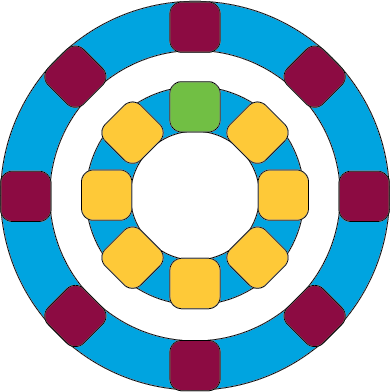 Journaling segments and more cycles of contraction and expansion could be added during a longer session. Participating in one of these sessions would have been interesting enough. Both sessions featured some great discussion and Professor Rohd’s techniques can be applied to almost any discussion session. De Bono, E. (1985). Six thinking hats (1st U.S. ed.). Boston: Little, Brown.